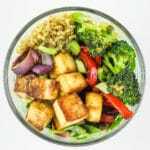 This teriyaki tofu meal prep recipe is a veggie-loaded lunch option that’s healthy, filling, and flavorful. Everything comes together on two sheet pans in under 30 minutes! In a mason jar or small bowl, mix together tamari, maple syrup, olive oil, vinegar, water, garlic, ginger, and cornstarch. Mix well. Preheat the oven to 375º and line 2 baking sheets with foil (or coat lightly with cooking spray). On one baking sheet, spread out the broccoli, red pepper, and red onion. Keep the broccoli on one end of the baking sheet – you’ll be removing it from the oven first. On the second baking sheet, add the tofu. Pour 3/4 of the teriyaki sauce over the veggies, and the remaining 1/4 of the sauce over the tofu. Place the tofu into the oven. After 10 minutes have passed, place the veggies into the oven. Bake for 10-12 minutes, then remove the broccoli and set aside. This allows the broccoli to keep a little crunch and not burn! At this point, give the tofu a stir on the pan to even the cooking. Return both pans to the oven and bake for 10 more minutes. Remove from the oven and allow to cool. Portion into meal prep containers with the grain of your choice – we like quinoa and rice!